GARDEN CITY, N.Y. — Chase Custom Auto Finance is coming on strong in the industry. According to officials, this segment of business almost doubled its production in 2006, and posted record results in the first quarter of 2007 in both performance and production. The company is witnessing the results of its merger with Bank One and subsequent full-spectrum lending program, Bill Jensen, national custom executive for Chase Auto Finance, reported to SubPrime Auto Finance News. "This is the outcome of the merger," Jensen explained. "The two management teams mapped out the future, and we saw the subprime business as a growth opportunity. Our outstandings are much larger now, and the segment of subprime is gaining popularity on the dealer side." Part of the company's strategy has been to open more local offices to better serve dealers, Jensen pointed out. Of late, Chase Auto Finance has added at least a dozen new prime/nonprime centers. For instance, in California, Chase previously had one office, now the company has six. "Our other area to improve was to increase capacity at existing offices," Jensen noted. "It was a pretty small operation in 2003 and 2004. We analyzed all those existing offices and added underwriters and funding specialists and more." In fact, Jensen said the company's attention to the prime/nonprime centers has paid off. In existing offices, the subprime auto lending business has grown by an average of 16 to 20 percent. And Jensen said the company hopes to continue that growth streak in the segment. Another area of expansion, according to Jensen, is increasing Chase's independent dealer base and enhancing relationships with the company's established dealer base. "We have about 1,500 commercial relationships, and we've made sure that all of those dealers are afforded a relationship with Chase Custom Finance as well," Jensen said. "So far, we've been very pleased with our growth." To keep the momentum going, Jensen said Chase will soon add prime/nonprime centers in San Jose, Calif.; San Antonio, Texas; St. Louis, Mo. ; and Cincinnati. "In a number of these offices, and in a number of these markets, we're already doing business," Jensen highlighted. "San Antonio has been serviced from our Houston office, so we've built up a base of dealers. Now we're going to the local market. Dealers very much like a local presence, and San Antonio is a little different than the Houston market. "Through the new office, we'll be able to grow our dealer base in San Antonio, as the local office will know the local dealer base better. It also frees up capacity in Houston so they can do more from that office," he added. Remarking on the popularity of the lender platforms, Jensen said about 95 percent of Chase Auto Finance's business is generated from DealerTrack and RouteOne. "Through the platforms, dealers can identify Chase prime or subprime, as well as locate Chase if they want to start a relationship," he explained. Another growing trend in the industry that Chase has been capitalizing on with its increase in dealer relationships is that if the prime segment of its business declines a certain application, the application will be passed along to the custom segment for another look, Jensen said. The remaining 5 percent of dealers who are not using the lender platforms generally are using a fax methodology, Jensen noted. However, he said this group of dealers is getting smaller every day as more learn the advantages of submitting applications via the lender platforms. As with most auto lenders, Chase Auto Finance has its own custom scorecard; however, Jensen said the company's average approved FICO score is about 550. In order to make sure dealers understand exactly what the custom segment looks for in applications, Jensen said underwriters and funding specialists are in constant contact with dealers. "The subprime business is a lot different from the prime business," Jensen pointed out. "From day-to-day, underwriters have close relationships with finance managers. All applications are discussed with the F&I manager. "We don't auto-approve, so we are always talking to the finance managers to make the best decisions we can for the customer, dealer and ourselves," he continued. "It takes more time, but being in the local market, knowing the local economy and dealers, helps us do this." 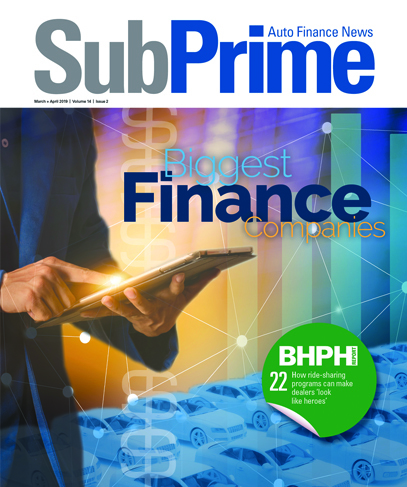 Despite recent fears from industry watchers that the downfall in the subprime mortgage market will impact the subprime auto lending market, Jensen told SubPrime Auto Finance News that he doesn't see this trend occurring. "The obvious assumption is that what's going on in the mortgage market will spillover into the subprime auto finance market," Jensen said. "For the most part, we don't see that that at all, including a waterfall effect or a concurrence effect. "There are two or three basic reasons for this," he highlighted. "First and foremost, in the subprime mortgage market the definition of FICO is 620 to 640 or 650 for a subprime mortgage. Subprime auto lending is 620 and down. It's a mismatch of ranges." Moreover, he said the majority of Chase Custom Auto Finance customers are not mortgage holders. They generally rent. "We watch the budget of our customers very closely," Jensen pointed out. "A subprime customer for us is a ‘need' customer. He needs a car. However, mortgage customers can always fall back to renting." He also noted that in the subprime mortgage sector, APR isn't always fixed and that can impact payments of a consumer and make it more difficult to fit payments into a consumer's budget. "An auto is a lifeline to employment and families," he explained. "However, if the subprime mortgage market gets too out of hand, it could impact the overall economy." According to Jensen, another difference between the two sectors is a breakdown of approval procedures. "In the subprime mortgage market, there appears to be a leniency in verifications of income and whatnot; in our business verifying income is standard operating procedure," he said. "There is no reason for us to have a breakdown in our procedures. "At the heart of the subprime auto finance business, we work very closely to see that our customers are within budget. That is pretty standard," he said. "Proof of employment, proof of income and the value of the vehicle is checked much more closely than a typical prime transaction. Prime business is more reliant on credit bureau scores. "We never want to put someone in a loan that they can't afford," he continued. "We understand that financial situations change, a pure cause for delinquencies and problems. But we're more diligent with putting our customers into the right vehicle and right payment structure." Jensen also discussed Chase's relationship with Subaru, noting that it began in 2001 and has grown over the years. "It's a great working relationship. We have a great mutual respect for each other," he said. "All of the Subaru dealers are signed to a custom program that's available to them. However, it isn't quite the volume as with dealers who have stand-alone special finance programs. "Due to our captive relationship with the automaker, we've generated almost 500,000 customer relationships." While Jensen acknowledges that the subprime auto lending business is risky, he said with the right underwriters, funding specialists, sales force, dealer partners and customers, Chase Custom Auto Finance will continue to expand going forward. "I see it continuing to grow," he explained. "Going into new markets, providing new services to our existing dealer base and more, will help us grow. We don't believe in growing our business through pricing. We are very comfortable with the way we perform. "It's a balance between providing a competitive product and providing excellent service and returns, and that is really our responsibility," he added. "We'll manage our business through the cycles. Flow of cycles fluctuate, but we've been doing business now since 1998 and we're very consistent through the cycles." For more information about Chase Auto Finance, call (800) 485-8455.